Stay Smart at our Tavares Hotel Near Mount DoraWelcome to the Holiday Inn Express hotel in Tavares, FL located along the Harris Chain of Lakes. We offer comfortable amenities and friendly service, making us the perfect choice for all travelers.Business travelers appreciate our Tavares hotel's location near many area companies in Leesburg and Eustis. We're just three miles from the Lake County Courthouse and five miles from Sleepy Hollow Sports Complex. To help guests stay connected, we offer free high-speed internet access, print, copy and fax services and a PC in the lobby. 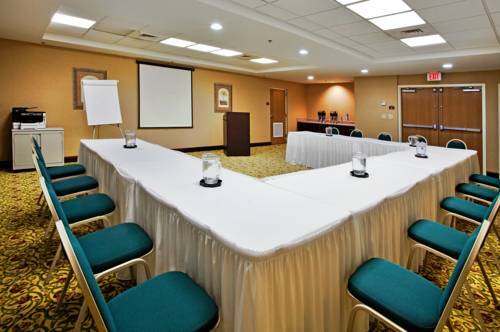 Our Riverview meeting room is ideal for any meeting in Tavares.This hotel's location provides easy access to popular area attractions, including historic downtown Mount Dora. Shopping enthusiasts can search for antiques at Renninger's Antiques. We are also near the award-winning Lakeridge Winery, which offers complimentary tours and wine tastings.You'll enjoy a carefree trip to Tavares with our hotel's excellent amenities and services. Join us each morning for our complimentary Express Start Breakfast Bar, featuring a variety of hot and cold items. Get an invigorating workout in our fitness center or enjoy a refreshing swim in our outdoor pool. Our hotel in Tavares, FL near Leesburg and Mount Dora is the perfect location. Stay Smart and book your room today! Hurricane Dockside Grill: Dockside on the Dead River next door to hotel. Indoor and outdoor dining. Large Menu with excellent food and prices. Live Entertainment on the weekends. Red Lobster: This chain seafood establishment has the popular new Red Lobster menu and the usual fantastic service. Childrens's program - Fishing on the Dead River Canal Nature Reserve behind hotel. County bike trail crosses through hotel property. Lake Square Mall and Supermarkets within 1.5 milesLake Square Mall is located 1.5 miles west of the hotel on Hwy 441. Lake Square Mall also now includes an entertainment center with an arcade, bowling center and bar. Deer IslandA challenging championship John Lee-design on a 400-acre island surrounded by Lake Dora and Lake Beauclair. Several signature holes with spectacular views, a welcoming new clubhouse, great food and drink in the Blue Heron Grill, knowledgeable Pro Shop. Valley View VineyardU-Pick farm. Peaches and other fruits. Renningers AntiqueArea's largest antiques and collectibles dealer. Venetian GardensBeautifully landscaped garden on the shores of Lake Harris. Public access. Walt Disney World, Universal Studios, Sea WorldTheme parks are south on the Florida Turnpike, then head West on I-4 and follow directional signs. Lake Sumter State CollegeLake Sumter State College is 5 minutes away West on Hwy 441.